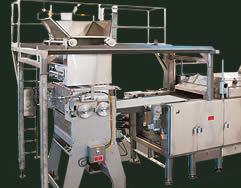 Compact system with a great production capacity. 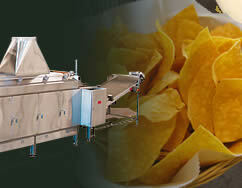 Easy to operate and works with great efficiency to form, press, bake and cool moderate quantities of flour tortillas. 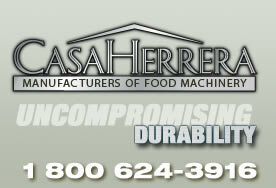 Capable of producing limited Pita Bread, Chapatis, and Pizza. It is engineered and tested to provide years of reliable operation, and embodies the most up-to-date features in the industry. Capacity: 80 to 320 dozens per hour at 16 strokes per minute. Meets NSF, UL, and ETL requirements. 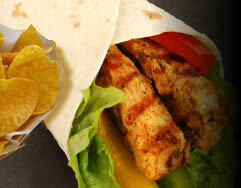 - Flour Tortilla Press, Atmospheric Oven and Cooler on Stainless steel support frame. - Servo Motor to efficiently and silently stroke the press action. 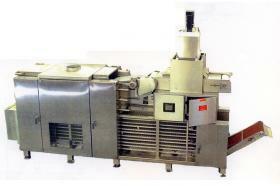 - Three pass oven with atmospheric combustion system. - Cooler with stainless steel "Cleat Track" belting. - PLC controls in electrical panel with stop/start buttons, temperature readout. - 15" x 15" steel platen area. - 6 heaters per platen for optimum heat distribution.